The earliest European settlement in the New World. The oldest symbol of Christianity found in the Western Hemisphere. The first refuge for free blacks in what is now the United States. In one exciting discovery after another, Kathleen Deagan has pushed back the frontiers of traditional archaeology and generated headlines wherever she works, says David Hurst Thomas, curator of anthropology at the American Museum of Natural History. “No archaeologist represents contemporary Americanist archaeology better than does Kathleen Deagan,” writes Thomas in his book Archaeology, probably the most widely used college archaeology textbook in America. 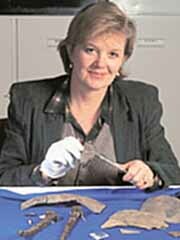 During her more than two decades of conducting excavations in the southeastern United States and the islands of the Caribbean, Deagan has made one astounding discovery after another, including: La Navidad on the northern coast of Haiti, Christopher Columbus’ first settlement in the Americas; La Isabela in the Dominican Republic, Columbus’ only American residence; and Fort Mose just north of St. Augustine, Fla., the first free black community in the United States. By building multidisciplinary archaeological teams that include historians, zoologists, botanists, architects, geologists and others, Deagan has been able to produce one of the largest bodies of historical archaeological data in the country. “This broad, comparative database is already being used to generate new theories about the consequences of encounter and exchange,” Deagan says. In addition to directing ongoing excavations at the original site of St. Augustine, Deagan has embarked on the excavation of another Columbus site in the Dominican Republic, Concepcion de la Vega. Deagan says Concepcion represents an intriguing slice of time between the Medieval and Renaissance periods.